Proclaiming the good news of Jesus Christ. Jesus Christ, the Messiah, never wrote a book yet His message of the Gospel and the nature of His love was indelibly impressed upon the hearts and minds of His followers who wrote about it in the pages of the Bible. They could never forget the love of their Savior and Lord. He was their model. His very life and sacrificial death clearly defined love for them – and for us today. 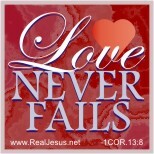 Categories: Love Never Fails | Tags: 1 Corinthians 13:13, Example, Jesus, Love | Permalink. Are Signs & Wonders for Today? Are You Gathering or Scattering? Did Jesus have long hair? Does a woman have more ribs? How well are you treating God’s temple? Is the Gospel in Christmas? WHAT DOES GOD'S WORD SAY? What does Shabbat Shalom mean? What was the original church like? Who's Responsible For Messiah's Death? Enter your email address to subscribe to our online messages and receive notifications of new posts by email. Has Science Finally Discovered God? Who wrote the Desert Song? Why did John the Baptist baptize with water? Show me your ways, LORD.